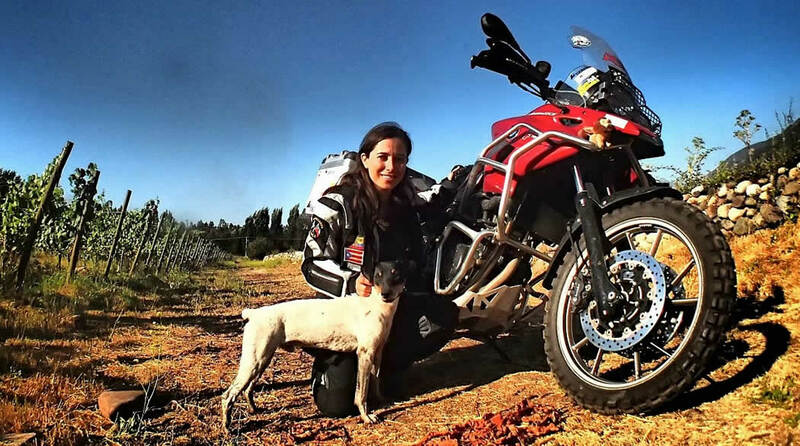 In this exclusive interview for GIVI EXPLORER, we had a long chat with Spain’s Alicia Sornosa, the first woman to ride around the world. Her résumé as a globetrotting motorcyclist qualifies her as an “expert”: therefore, we asked her for some tips for other women bikers who want to travel alone. Hi Alicia. Our readers already know who you are and what you’ve done. With your help, we’d like to make up a sort of REFERENCE GUIDE that can be useful for women who – like you – decide to take off for remote destinations alone and riding a motorcycle. I’ve prepared a series of questions, but please feel free to add, remove, or change things… based on your extensive experience. Are there general rules to follow before leaving? Leave all preconceptions behind. Fill your mind with humility and always smile. Always be prudent, but trust your instincts. Which countries should be avoided by a woman traveling alone? All those countries where sexism is strong, or where wars have driven away the population. If this scenario doesn’t stop you, then choose countries where fighting is taking place only in certain, circumscribed areas. The bigger the country, the more possible it will be to pass through it while keeping away from the war zones. But try to do so quickly, and don’t do anything to attract attention. Contrary to what one might think, in countries where women are forced to follow rules that are totally different from Western ones, there are generally fewer risks. Taking off with a bike in perfect mechanical condition is important for everyone. For a woman, does this rule become top priority? It’s exactly the same as it is for a man. Whoever travels alone has to learn how to do maintenance operations (changing oil and filter, spark plugs, cleaning the chain…) and be able to deal with a punctured tire. I don’t have any in-depth know-how. Today’s bikes are too complex at the mechanics, frame, and running gear level to be able to do anything on them. Where and how do you conceal your documents and money? Hoping there are no robbers or thieves reading this interview, I travel with some money in a wallet, and some hidden in the gear and bike, and of course I carry a VISA card to be able to draw money from my bank account in countries where that’s possible. What do you do if you’re forced to stop in a desolate area? If the stop is because of a flat tire, I use the tire repair kit. If that’s not sufficient, I try to continue as far as possible with the flat tire. If the problem is with a mechanical part, I wait for someone to pass by who might be able to help me. This, too, is adventure, and should be lived as a fun part of the trip. As a last resort I can use the SPOT emergency GPS tracker I carry along with me. If you ask for help, how do you know whether or not you can trust the person you’re talking to? Look whoever offers to help you in the eye. Use your instinct and intuition. If you notice something unusual, it’s best to turn them down. In my long motorcycle trips I’ve never run into trouble, but I realize I’ve been very, very lucky. Can it be risky to travel after sundown? It always is. Roads are often poorly lit, and in many countries a possible encounter with animals, people on foot or on bicycles without lights is around every bend. And then there are the potholes, which you can’t see in the dark. It’s best to avoid riding after 6 pm. Can it be useful to carry along pepper spray? What is the proper conduct to have at customs? You have to have a lot of patience. Bring along several photocopies of all your documents. Smile and pass the time chatting with people, take pictures… in short, just act like a “tourist who can’t wait to enter their extraordinary country”. Is it useful to keep a low profile? For example, wear “technical” clothing that’s not very feminine? Trying not to attract attention, being discreet and friendly is a basic rule. There’s no need to travel dirty and with your clothes in tatters. In many countries outside of Europe, traveling by motorcycle is already, in itself, “low profile”. For example, in certain African countries the common opinion is that someone who has money travels comfortably by car, and not on an uncomfortable motorcycle. Can it be a good idea to seek travel companies along “critical” stretches? More than just a good idea, it should be standard behavior. Tackling certain stretches alone could mean – in the case of an accident – non-survival. It’s best to wait a bit, even a few days, and join up with someone else who’s doing the same route. It’s a bit like mountain climbing: you should always do it together with someone. Is it necessary to add useful phone numbers (police, hospital, etc.) every time you enter a new country? It’s useful, but what helps more is if you learn a few key words in the local language. Before the police can arrive, it’s the local population that may be able to help you. Have you ever found yourself in a dangerous situation? How did you cope? I experienced a 7.5-degree earthquake. Like everyone else, I waited for the shocks to stop. It was really frightening. During my travels I’ve felt fear a number of times, especially in situations where I’ve ended up in bad areas by mistake. Luckily an “angel” has always shown up to help me. Staying calm and not getting panicky helps you get through it. How much influence does the knowledge of languages have on the outcome of a trip?